Eniva® LifeCleanse is a unique, natural fiber and herbal supplement that provides for easy, gentle elimination and digestive cleansing. LifeCleanse is an excellent source of fiber. 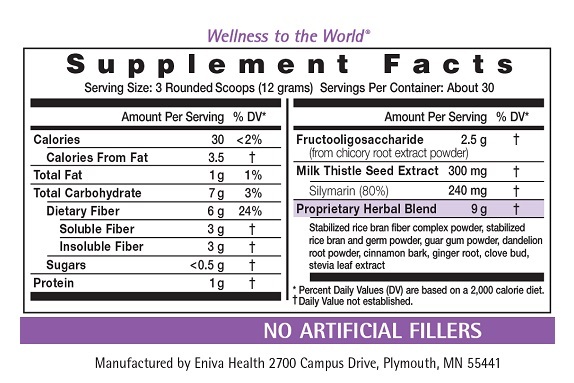 • Eniva's LifeCleanse contains 12 grams of fiber per serving, helping to fill "nutritional gaps" in the diet. • Flavor is a fruity, sweet cinammon taste. • Contents are a brownish gray powder. • LifeCleanse goes well with apple juice. It is quite pleasant even in straight water. • 10 servings per cannister, which includes a plastic scoop. Some of the ingredients function as carminatives, and others as anti-spasmodics to make this powerful cleanser's work as gentle as possible. Directions: Adults: Add 3 scoops/tablespoons to minimum 8 oz. of water. Consume 1 hour after the evening/last meal with plenty of liquid to prevent choking. Recommendations of Use: Avoid taking at the exact time of day when medications or other Eniva nutritional products are consumed in order to prevent potential interference with absorption. Some individuals may find one tablespoon per day sufficient for bowel cleansing; may adjust dosage for personal preference. Notice: This product should be consumed with at least 8 oz. of water. Taking this product without enough liquid may cause choking. Do not consume this product if you have difficulty swallowing. Storage Directions: Keep in a dry place with cap tightly closed at all times. Avoid freezing or excessive heat. CAUTION: Do not consume if tamper resistant seal is broken/missing. Do not consume if allergic to components found within product, if abdominal pain, cramping, nausea, vomiting, or rectal bleeding are present, if any obstructions are present in the digestive or eliminative tract (e.g. gall stones, lack of bowel movement), or urinary tract or if you have difficulty swallowing. Discontinue or reduce if stool becomes excessively loose or excessive gas is present. Consult your physician before starting this product if you have any health problems including blood sugar control problems. Do not use: If taking prescription medications, have an ongoing medical condition, are pregnant, nursing or under age 14. KEEP CAP TIGHTLY CLOSED. KEEP OUT OF REACH OF CHILDREN. I have tried a lot of bowel products and this is the best I've found. It keeps me regular. I like how it's gentle, but it gets the job done if you know what I mean.